Did Einstein think in pictures rather than words? Yes, his great breakthroughs came from visual experiments performed in his head rather than the lab. They were called Gedankenexperiment -- thought experiments. At age 16, he tried to picture in his mind what it would be like to ride alongside a light beam. If you reached the speed of light, wouldn't the light waves seem stationery to you? But Maxwell's famous equations describing electromagnetic waves didn't allow that. He knew that math was the language nature uses to describe her wonders, so he could visualize how equations were reflected in realities. So for the next ten years he wrestled with this thought experiment until he came up with the special theory of relativity. 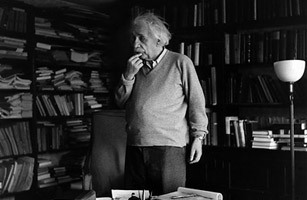 See photos of the life of Albert Einstein.